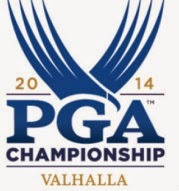 LOUISVILLE, Ky. - My first drive to Valhalla Golf Club for the 2014 PGA Championship was better than expected. A kind person let me in on the Indiana side of the I-65 bridge that crosses the Ohio River. I then got on I-71 north and was pulling into Valhalla's main gate on Shelbyville Road much sooner than I expected. British Open champion Louis Oosthuizen had an even better drive at Valhalla on Tuesday. The South African won the long-drive competition with a poke of 340 yards. If you haven't heard of the long-drive contest, that's because the PGA of America just brought it back to the PGA Championship festivities after a 30-year absence. It's a good year to bring it back, too. The first one held by the PGA was here in Louisville at Big Spring Country Club way back in 1952. How it worked: Players' drives were measured on the par-5, 590-yard 10th hole. Drives had to land in the fairway to be counted. You might wonder how the PGA Tour's longest hitter fared in the competition. Bubba Watson announced last weekend that he wouldn't participate. Instead, Bubba teed off with a 3-iron on the 10th. As long as Louie hit it on Tuesday, Jack Nicklaus hit his even longer when he won the long-drive contest in 1963 at Dallas Athletic Club. Using a persimmon driver and a wound golf ball, Nicklaus drove one 341 yards, 17 inches. "It was a great gallery favorite," Nicklaus said about the long-ball competition last Thursday. Jack won a money clip. Fifty-one years later, so did Louis.